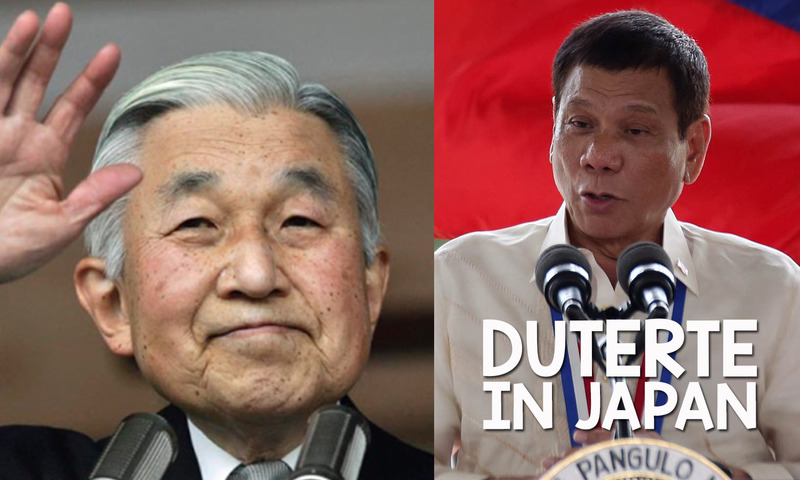 In a statement released on October 12, Department of Foreign Affairs (DFA) announced that President Rodrigo Duterte will meet with Japanese Emperor Akihito during his 3-day visit to Japan that will commence on October 25. Duterte will visit Japan "upon the invitation of Japanese Prime Minister Shinzo Abe," the DFA said. During his visit, the President will meet with the Japanese Prime Minister. He will also make a State Call on His Majesty Emperor Akihito of Japan. Duterte and Abe are also set to meet during the visit. The two leaders first met on the sidelines of Association of Southeast Asian Nations Summit in Vientiane, Laos in Sepetember. During their meeting, Abe told Duterte that he is "very famous" in Japan. Japan has been a longtime ally of the Philippines and is one of its top provider of development aid and trade partner.